On Juhannus (midsummer) Saturday Eve & I decided to go and visit Tony & Cindy at Tony’s family summer cottage on Eskholmen, at the end of the Prokkala peninsula (west of Helsinki). My navigation software told me the trip was about 42km, but the wind was against us and we had to tack all the way, so we probably did nearer 60km. 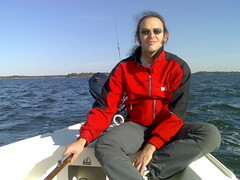 It took us 8 hours to get there, and for most of the time we were doing 5-6 knots. We arrived at the cottage just after 8pm, and went to the sauna and then grilled some sausages and sat drinking wine & whisky with Cindy & Tony. We slept on the boat (fine, but we must get curtains to keep out the early morning sun), and then the following lunchtime we took Cindy & Tony for a short sailing trip before returning to Helsinki. The return trip took just 5 hours (running before the wind through the archipelago), and we got home satisfied but exhausted. 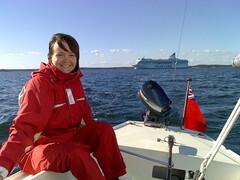 Here’s a short set of photos from the trip: Porkkala Cruise, Juhannus 2006. 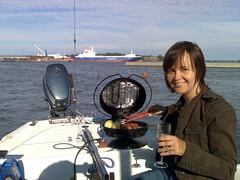 On Juhannus Eve I was too sick to go and celebrate properly, so Eve brought some sausages & sparkling wine to the boat and we had a picnic there. 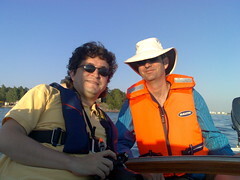 Carlos & Jim joined me for an evening’s sailing. There was almost no wind, so we just drifted slowly around the harbour. Sometimes we almost got up to a leisurely walking pace, other times we were asking each other, “are we actually moving forward”? After Eve’s bad experiences sailing the previous day, we decided to change our planned sailing trip with Marko & Isabella into a picnic on the boat – sorry about that! Mari joined us too. 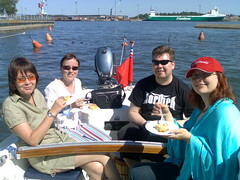 Michael & Helena joined Eve & me for an afternoon trip on our sailing boat. The wind was rather strong and the boat was pounding through the waves and heeling over at 45 degrees most of the time – lots of fun for me, but on this occasion rather too much for Eve. We dropped her and Helena off at Suomenlinna and sailed back to Merihaka, where the girls joined us for a picnic (having come back from Suomenlinna by ferry after having a couple of beers at the pub there). 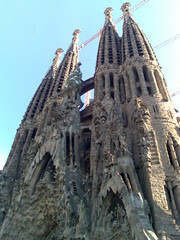 At the start of June we had a holiday in Catalonia – first a few days in a villa near the small village of Begur, then a few days sightseeing in Barcelona. I’ve finally got round to uploading the photos. 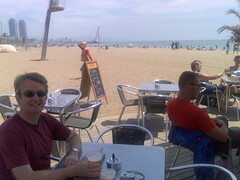 Eve & I are having beers at Gaudi’s Park Güell, in the hills surrounding downtown Barcelona. 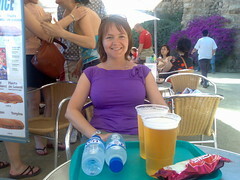 We’re having more beers at Park Güell in Barcelona. We just listened to a small band called Aereo who were playing under some of Gaudi’s ‘Gothic’ arches – they were good, a warm and mellow sound, so we bought their CD. We’re in the medieval village of Peratallada, having a very fine lunch. 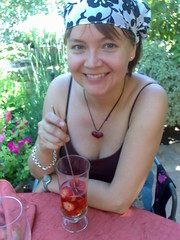 Here Eve is enjoying her dessert: strawberries in Muscatel wine.